Syttende Mai to you, too! It’s Syttende Mai Eve. Do you open your aquavit on Syttende Mai Eve or Syttende Mai morning? For the non-Nordic types reading this, the world in which I find myself these days is heavy on the Norwegian side and every 17th of May is a big deal. It’s Syttende Mai, or for those of us without Google translator handy, Norwegian Constitution Day. Well, in Seattle, in the Nordic suburb of Ballard, Norwegians near and far gather to celebrate day. This year, being on a Saturday, promises to be quite the celebration. What makes the 2014 edition even more special is that it’s the 200th anniversary of Norway’s constitution and the 125th year of the parade in Seattle! In fact, our Syttende Mai parade is the largest in the U.S. and second only to one held in Norway. The size of the parade actually rivals the annual Seafair Torchlight Parade. However, while there are marching bands and drill teams, V.I.P.’s and such the bulk of the parade is filled with Norwegians and their various groups from all over the area. Sons of Norway lodges, Daughters of Norway, the chorus groups, the clubs…they’ll be there marching through Ballard, rain or shine, starting at 6pm. 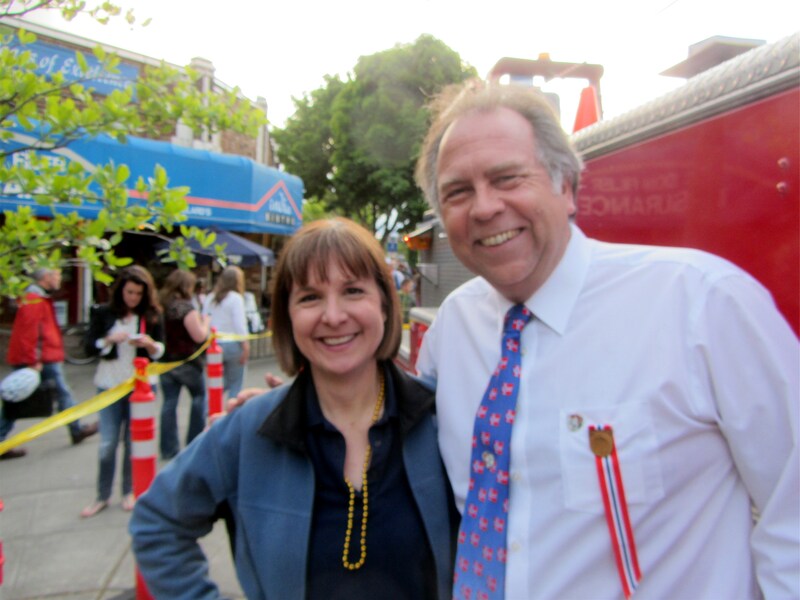 For the third year in a row, I have the honor of being one of the parade announcers, along with Ballard resident and Q13 weather goddess, M.J. McDermott. The day begins with Mayor Ed Murray making an appearance at Bergen Place Park at 10am to kick off the day. There’s a sold-out lunch with VIP’s at the Leif Erikson Lodge and then various happy hours throughout Ballard to get the marchers ready for the big event. So, if see people running around on Saturday dressed up in their Norwegian outfits, now you’ll know why. If you want to blend in, say something like, “Nice bunad!” (BOO-nod) or, “Hurrah for Syttende Mai!” (sitten-de-MY) and you’ll probably be asked to join one of their organizations! Remember, all the Norwegians are IN the parade, so if you’d like to help make up the crowd, it steps off at 6pm.